TeleCommunication Systems, Inc. (TCS) (NASDAQ: TSYS) has received certification by the Federal Emergency Management Administration (FEMA) for its Commercial Mobile Alert System (CMAS). The company successfully met FEMA's CMAS ATIS/TIA J-102 (Section 5.3-Inter-Gateway Test Cases) standards testing in order to qualify for the certification. With this CMAS certification, wireless carriers using TCS' system are assured of interoperability testing (IOT) compliance in time for the April 7, 2012, CMAS implementation deadline and will not need to spend additional time and resources going through the testing process. There are approximately 140 wireless carriers who have opted to participate in FEMA's program, either in full or in part. CMAS is the result of an executive order signed by the president in October 2006 which mandated the development of an emergency alert system for U.S. residents to be delivered via mobile phones. Over the past five years, FEMA, the Federal Communications Commission (FCC), TCS and others have developed a standard which uses cell broadcast technology to ensure that emergency messages will not be caught up in point-to-point congestion that can occur during an emergency. CMAS will deliver 90-character, geographically targeted alerts about imminent threats to life and property, Presidential Alerts (such as a notification of a terrorist attack) and AMBER alerts. Mobile phone subscribers in the area at risk will receive the alerts in the form of a short text message and a special sound and vibration on any CMAS-compliant handset. The alert will notify mobile phone users of the emergency and tell them how to obtain additional information regarding it. As a leading U.S.-based technology provider for text messaging, public safety and location solutions, TCS powered the delivery of nearly one trillion text messages and half of all wireless 9-1-1 calls in 2010 alone. 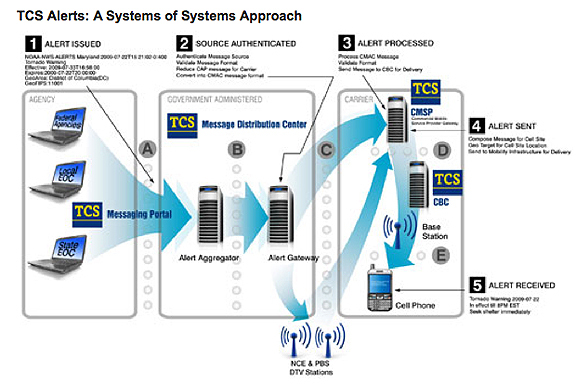 With the nation's only non-carrier TL 9000-certified network operations center (NOC), as well as extensive provision of E9-1-1, text messaging, and location-based services, TCS possesses the experience and technical capabilities necessary to position carrier customers to meet the FCC's CMAS requirements.